When feeling overwhelmed by responsibilities, children, noise, oh… just life in general, the handsome husband and I often fantasize about buying a swath of land way north in the state and plunking an off-the-grid, tiny house on it, just for us two. I totally think that we could live in 100-150 square feet for a week or two at a time, especially when the weather is nice and we can be outside hiking and whatnot. But live in a tiny house full time? Hmmmm…. not for me. It takes a different sort of person to want to live in a tiny house. I don’t mean vacation in a tiny house; I mean live in a tiny house. One immediately thinks of a minimalist type of character who boasts a bare bones wardrobe and a pared down interior décor. This fictional tiny house owner most certainly borrows books from the library rather than accumulating them. Together, homeowners Chloe Barcelou and Brandon Batchelder own B&C Productions , a set design company for film, theater, and photography. (You MUST go to their website and see their body of work. It is the coolest thing ever. 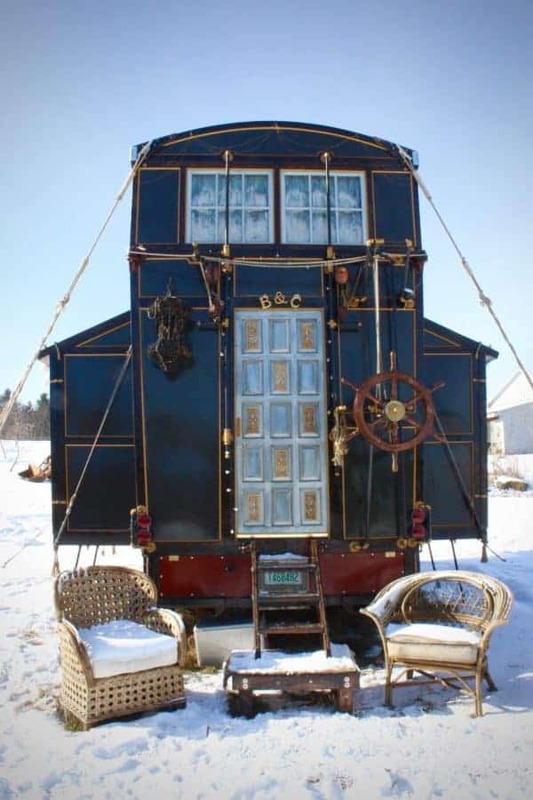 It also includes all of the nitty gritty details of their tiny house creation process.) Having met in 2009 at a Starbucks where Chloe worked as a barista, their professional paths began merging when she quit her day job and began working as a junior stylist for ENNIS, Inc., a multi-specialty styling agency. As her creations grew ever more fantastical, Brandon quit his day job and turned to his considerable carpentry skills to making her imaginations a reality. Chloe’s singular mix of fine art, fashion and fantasy gained the notice of filmmaker Hooroo Jackson, who hired her to art direct her first feature film, Aimy in a Cage, in 2014. In the short time since then, the two have set the stage for five films – as well as the most astonishing tiny house I’ve ever seen. 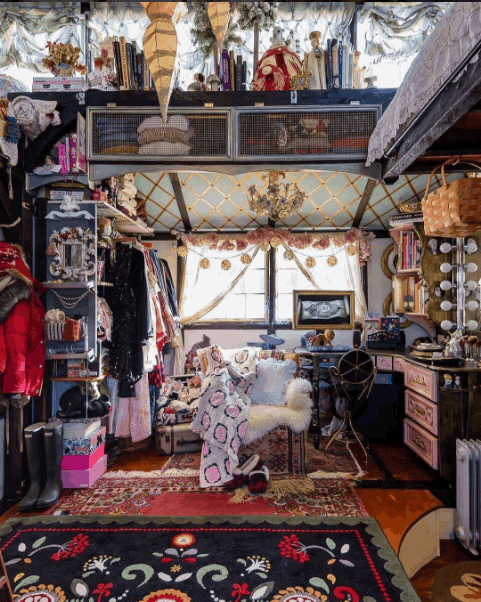 Inspired by the styles of Tudor storybook cottages, steamer trunks, clipper ships and gypsy caravans, Chloe and Brandon constructed their tiny house almost entirely from recycled salvage, much of it from the sets they concocted. While they loved the look of colonial timber framed homes, Chloe and Brandon knew actual timbers would be too heavy for the trailer. Hooroo had a huge pile of 2 x 4s left over from the Aimy set, so he gave them to the pair to save himself the money and trouble of having them disposed of. They then made fake timbers by putting four 2 x 4s together to create hollow beams and hand-planed them for effect. 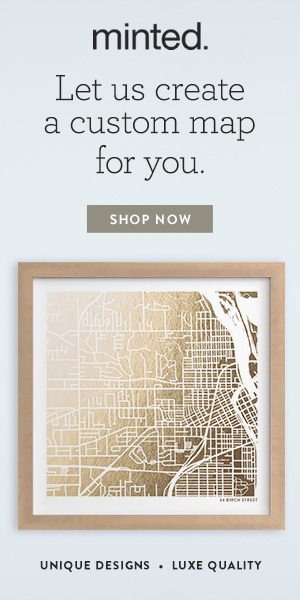 One might think that because the house is heavily decorated that it cost a lot. But the two are super frugal. Many of the items in their home were found on the road side or at garage sales and made over to their needs and style. That gorgeous mahogany ladder, btw, was made from the trailer platform’s original side rails. Who the heck uses mahogany on a trailer???!! And why can’t I find a trailer like that? That’s the heater under Brandon’s desk. It was surprisingly toasty when I visited. Music room, where he can serenade his lady love. His closet. If only my handsome husband were this dapper. Her office. Chloe’s desk cost all of $40. And dressing table. Love the “tiny” scent bottles! And tiny pocket Shakespeare volumes! I want those! Barbie finally wised up and ditched Ken for a real man. David, in this case. The kitchen. The cabinet cost a grand total of $28. Of course there is “The Forest Feast” cookbook, but do they really forage for food in the woods out back? And with a little mood lighting. The guest room on the opposite platform. If you plan to stay the night, I hope you don’t have vertigo! The pièce de résistance — that chandelier. The couple bought the hand-made, one-of-a-kind piece off the Aimy set. It is absolutely magical against Chloe’s hand painted circus tent ceiling! Backbreaking hours of work I bet. The library. I knew I liked these people. Wait, Shakespeare, Doyle, and London! And a whiskey flask?! I LOVE these people! So, yes, the decor is amazing, but what about the essentials? Like, you know, the essentials…. I think I’d feel like a stowaway on Captain Nemo’s Nautilus if I got to shower here every day! Brandon and Chloe made this shower from $25 of scrapyard materials ground down to bare metal and riveted together. The window is a $1 Crockpot lid. And the most essential spot of all, topped off with a granny-chic butterfly lid. Creativity extends well beyond the décor. Most things we average homeowners take for granted – heating, water, waste disposal, winterization – Brandon has engineered from salvaged parts, including the side bump-outs and the intricate pulley system that raises and lowers the roof to create extra space when they are parked. Ahoy! All hands on deck! Roof coming up! This lantern has nothing to do with the pulley mechanism, but it’s really cool. The gravity fed water system. Even it looks cool. The big problem — how to keep the water in the tanks from freezing? We do live in New Hampshire, after all. The two estimate the house has cost them a total of $15-20K. They plan to put in another $5K, much of it in updated systems, which, I assume, will include insulating the water tanks! And perhaps a table to eat dinner at. Beyond the obvious challenges of living in a tiny house they made themselves, I ask if there are any unexpected benefits they’ve experienced. “I know that we don’t really face the hardships of the pioneers, but it definitely sometimes feels that way! If we need, we make it. And that’s all folks! Could you live in a tiny house full time? I guess, perhaps the better question is, could you live in a tiny house full time with children???? ‘Til next Saturday, stay warm out there! What a wonderful Post Amy. I think the small house movement has a great future. 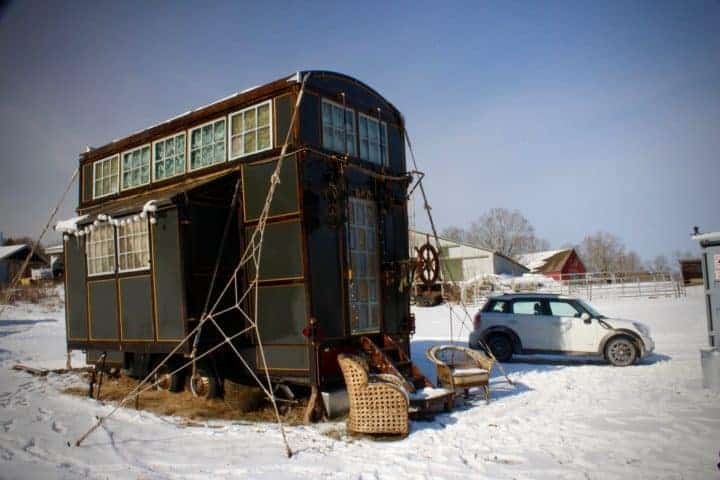 First homes for those out of Collage, a good way to down-size and see you grandkids at the same time, and a way to move around the country for mobile or free-lance work like this couple.